Now that I had three swims under my belt I felt confident of my ability to swim in the ocean. I had forgotten that you should never take the ocean for granted. I was living in Sydney, but still travelled back to Newcastle regularly for work and to play an occassional game of cricket on a Saturday afternoon. The club I played for always had a special game for the last game before Christmas, and I noticed on oceanswims.com (the source of so much useful info on swims) that there was a swim in Newcastle on the Sunday before Christmas. As I would be in town for cricket the day before I thought that I could stay overnight and do the swim the next day. I had already swum the same course the previous season so thought this would be too good an opportunity to miss. So I entered the swim. The day of the event was a warm day. When I arrived at Cooks Hill Surf Club on Bar Beach I noticed that the surf was larger than the previous year, but I was not concerned at all. I caught the shuttle bus down to the start line at Merewether Beach and listened to the briefing. The swim was straight forward: enter at Merewether, swim out to the first buoy just off the beach, then turn left and swim north to Bar Beach, turn left again, swim in and finish. Easy. The waves before mine entered the water, and several of them were smashed by the swells hitting Merewether Beach. This made me sit up and take notice. I really had no experience swimming in such conditions. However, I knew that I could make the distance without a problem, and I had recently increased my training distance and regularity. I did notice that the swim had more swimmers this year than my previous swim. I was glad about this as there would be more people to follow. So my wave started and it was a bit of a challenge getting out to the first buoy. But I did find that I was not exhausted by the time I arrived, unlike my first attempt. I then proceeded to swim at my steady pace noticing the swells that lifted me as I went across them. One of the features of Bar Beach is the reef just to the north of the surf club that at times is adjacent to the flagged swimming area. I had taken note of the north-east swell so my plans were to swim north of the last buoy and then use the swell direction to guide me to the finish line. So imagine my surprise when the water safety people ordered me to turn to the beach immediately. My plans were in disarray as I reluctantly followed their directions. As I got to the wave zone I felt the pull of a rip impeding my forward progress. They had sent me straight into a rip. That rip was sending the water out from the beach and I was trying to get in. I remembered that if you are in a rip you should swim across it. But at that moment a set of waves came through and I was pushed past the rip in a very ungainly manner. So I had got past the rip but I was getting fatigued. I was by then about thirty metres off the beach in a gutter between a sandbar and the shore. Now I faced another problem: a strong sweep was pushing me down the beach away from the finish line. I tried to swim across it, but by this time I was getting very tired. I did seriously consider putting my hand up to be rescued but thought by the time they got to me I would have got to the beach. I saw on several occasions the sand moving backwards out to see and down the beach simultaneously. Suddenly my feet managed to find the bottom and I stood up in water chest deep. I then pushed hard to the shore about ten metres away and finally made it out of the water. I then looked up and I was about 100 metres south of the finish line. I was exhausted, and that 100 metres was taken at a very slow walk. I had made it but only just. Lots of people were rescued and I could only think of those water safety people giving us bad directions. My time was eight minutes slower than the previous year, but I had finished in the top third of the field. My confidence in my ability to swim in the ocean was shattered. But I had finished and I had managed to beat a lot of people. I knew then that if I wanted to get into this sport I would have to get fitter at this swimming caper. I also knew that playing cricket in the hot sun and having a few beers the day before a swim was not the sort of preparation that would be recommended to undertake an ocean swim. After my return from Europe I needed to find a new training pool. I went to the North Sydney pool about a 10 minute walk from where I was living. This pool has the record of being the pool that has had the most number of world records set in it. It was the pool where the Australian titles were held in during the 1950s and 1960s when people like Dawn Fraser, John Konrads and Murray Rose ruled the waves. The pool has two pools: a 25 m indoor heated pool, and a 50m outdoor heated pool. Both are open all year round. The location under the arch of the Sydney Harbour Bridge with views across to the Sydney Opera House. Magnificent. So I started swimming there by myself in the evenings. I would start by doing a one km swim, and after a few weeks increased this to two kms non stop. I had a plan to swim the Cockatoo Island swim in late November, a distance of two and a half kms. This island is in the western part of Sydney Harbour and was a shipyard and before that a convict prison. Now that the industry had left it was trying to re-establish itself as a place to visit with comedy festivals, tourist accommodation and a ferry service. I entered the swim knowing that I would not have to worry about waves and rips. Several people at work asked if I was scared of the sharks in the harbour. My view is that you are more likely to be injured getting to the swim, and besides the water makes it hard to see more than a couple of metres anyway. 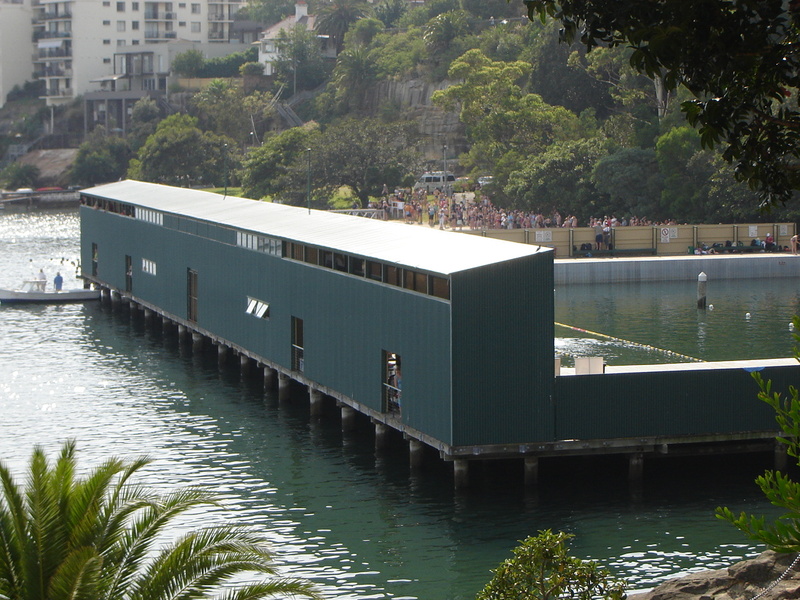 The swim starts at the Dawn Fraser pool in Balmain, which is a delightful harbour pool with its historic facade in place. You then swim clockwise around the island and back to the pool. Easy, especially if you breathe on your right. The other highlight is the excellent summer fruit supplied by a sponsor and the free bbq for swimmers. The forecast for the day was hot over 40 degrees. We were still in the grips of a drought and the land was parched. And this was just the start of summer. Fortunately the swims start in the mid morning and the worst of the heat would not arrive until mid afternoon. I registered for the swim and then joined my wife back up in the park with a great view of the course. It was a pleasant place to hang out while I fuelled up and drank fluids to stay hydrated. I was confident of making the distance, as I had lost weight on my walk across Spain, and my swimming was going well. The only thing to deal with was the tide which would be coming in during the swim. Another feature of this swim is that you start in the water. Luckily at this time of year it was quite warm and the starter got us away quickly. There was lots of thrashing about at the start, but I decided to let them all do their stuff and I would just follow. Before long we had made it to the island, and then started our trek around it. Along the southern side I was moving extremely fast and thought wow this is great. It was not until we got to the other side that I realised this was the tide and I would have to swim against it. By that time the ferry traffic had kicked up a chop on the water so it was a bit of a slog around the northern side. 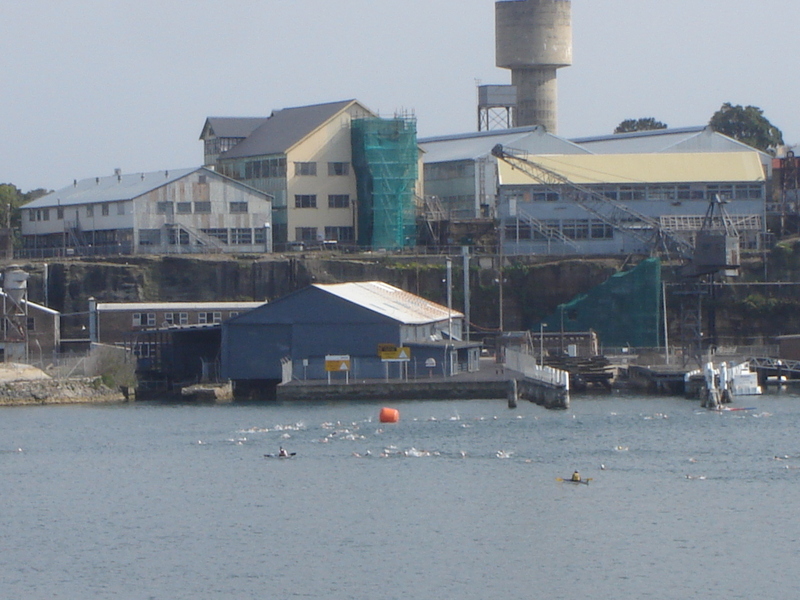 It was good to look at the industrial landmarks on the island, and to keep an eye out for the crane that signalled the turn for the finish line back at the pool. I made it back to the pool swimming a sort of straight line. A climb out of the water onto a pontoon, and then the manual time keepers recording your time and number. Then into the pool proper to get some mango and sausage sandwich. I was happy with my first swim in the big smoke. Now that I had moved to Sydney I thought that I belonged. I checked my results on the oceanswims site and I had finished in just over 44 minutes and placed about halfway in the field. Not a bad result. Now that I had completed my first swim it was time to look at doing another swim. The best place to find out about ocean swims was oceanswims.com which was a website listing details of all the swims in Sydney and surrounds, and also let you enter them. I saw that there were not many swims in Newcastle, and I did not feel ready for a trip to the big smoke to swim against the hot guns there. There were three swims left in Newcastle: the Harbour swim on Australia Day over 1.4 km; the Cross the Lake swim a 3.8 km epic that had been running since Menzies was prime minister; and a 1.5 km swim at Caves Beach in March. I knew I was not up to a 3.8 km swim, and did not feel like swimming in Newcastle Harbour which had a reputation for pollution. So that left the Caves Beach swim. I had grown up on this beach so I was very comfortable with the prospect of competing there. I knew that the beach was protected from southerly swells by a breakwater built by a dreamer to load coal for export to Japan. This dream never eventuated and it was now used by fishermen. There was also a couple of reefs which moderated any NE swell. I decided to up my training schedule and for a few months swam in the pool four times a week. The day of the swim arrived. It was sunny and warm and only a small swell running. I registered, said hi to some work colleagues who were on water safety and then walked down to the start line. I was in the third wave with all the other males over 35. I looked around and thought some of these looked fit. I watched the earlier waves start and they were fast. My turn to go. I entered the water and was happy that there was no swell to battle through. A large number of swimmers in my wave swam off and I was left in their wake. I knew that the course went near a reef and the swell direction would make it interesting crossing it, so I went wide. By the time I turned for home I felt fresh. I swam to the beach getting little assistance from the samll swell. Now one of the features of Caves Beach is that a low tide it is a long way from the water’s edge to the surf club where the finish line was. And it was low tide. So then there was a run that seemed about 500m long to get to the finish. I had finished. I grabbed some fruit and drinks pleased that I had completed my second swim. I had done a faster time (24.35), but of the 292 swimmers I had come 170th. I knew that if I wanted to get better results I had to lose some weight and get fitter. My first season was over: two swims with a distance of 3.0 km. I was hooked, and I knew that I wanted to get better at this. As part of my fitness drive I went on holiday to Europe and did a Camino walk in Spain covering 500 km on foot. 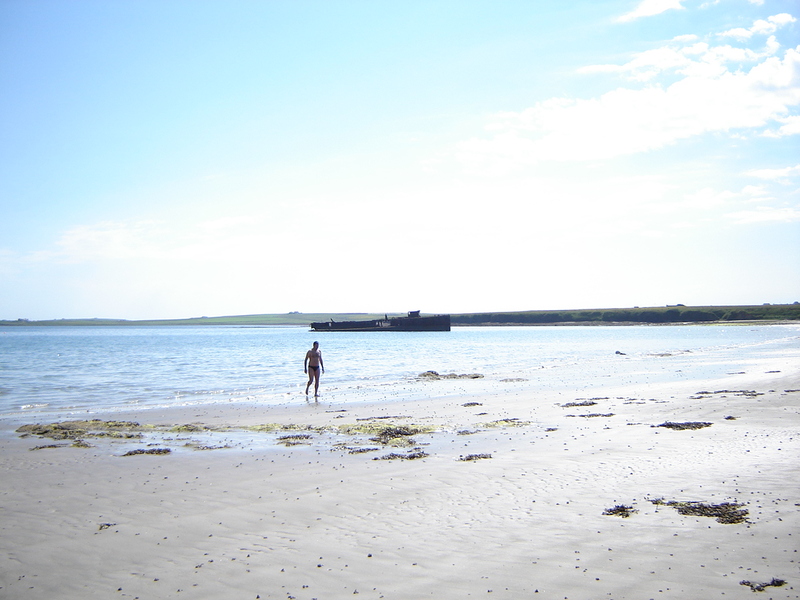 I did swim in the Orkney Islands in late June. The water was 11 degrees, and my speedos provided little protection against the cold. I could not feel my feet after 10 seconds. 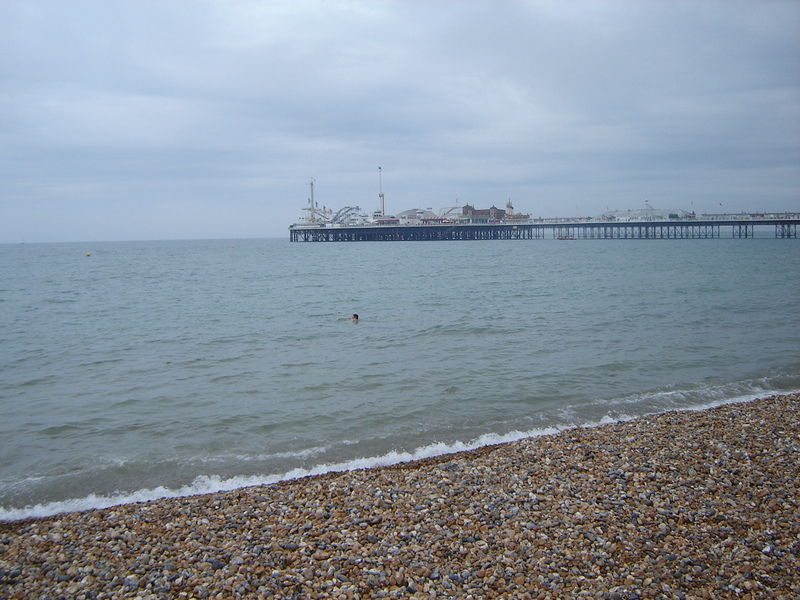 I also swam at Brighton in early July and the water was a lot warmer there, though the pebbles sure were hard on the feet. In both places I was the only person swimming. What would be next on my swimming adventure? So how did I get into ocean swims? I had swum for a couple of years in Merewether Baths with some friends from work. We would ride our bikes up the pool from work in the city (a distance of around 3 km each way) during our lunch break. We would then swim 1 km in the pool and we would do this a few times a week year round. Of the three of us I was the fastest due to my pool swimming when I was a boy. I started this exercise regime to try to keep fit and to enjoy the salt water pool throughout the year. After about 12 months of this I was looking for another challenge, as I was getting quicker in the pool. The local surf club then advertised a swim called Baths to Bar. This was a swim from Merewether Surf Club to Cooks Hill Surf Club on Bar Beach a distance of 1.5 km. So I enrolled in the swim and convinced a triathlete friend to swim with me. I was confident as I had swum at both beaches several times, though always within the flags. I increased my distance in the pool to see if I could swim 1.5 km non stop, and I could. The swim was scheduled for late November 2008. Now November is an interesting time in this part of Australia. The air temperature can be 30 degrees plus, and the sea water temperature can be around 16 degrees. At that temperature it would be advisable to wear a wet suit. The day of the swim was cold. The air temperature was 13 degrees with a westerly gale blowing (it was snowing up in the mountains), so the wind chill was in single figures. Luckily the water was only 15 degrees, and the organisers agreed to allow competitors to wear a wet suit. I chose to wear mine, my friend decided not to. So we went to the start line, and I stayed warm due to my wet suit. I had not even thought how I was going to get through the break, and was intrigued to watch the elite wave get smashed by a big set when they started. I hoped that my wave would be more gentle, and luckily it was. I managed to get out through the wave zone without having to go under a wave. So far so good. First buoy was off the beach and then you turned left to swim north. The problem was by the time I go to that buoy I was puffed, and I contemplated pulling out because it was so cold. However, I decided to keep going as my wife was waiting at the finish line and I wanted to test myself. So I put my head down and swam. I swam to seaward of the guiding buoys well away from most of the other swimmers. I was by myself most of the time, which I had planned. After what seemed ages I turned left and followed the course into the finish line. The strong winds had reduced the swell so it was quite easy getting in. I walked slowly up the sand exhausted. I had finished. I then had a chance to check my time of just under 27 minutes, and I thought that was quite good. My wife rushed over to tell me that my friend had finished a few minutes earlier, but he was very cold and was in the car to get warm. So now I was an ocean swimmer. I finished 72nd out of 144 starters, and I was very happy with that. I had walked the length of that beach many times, but now I had swum it.